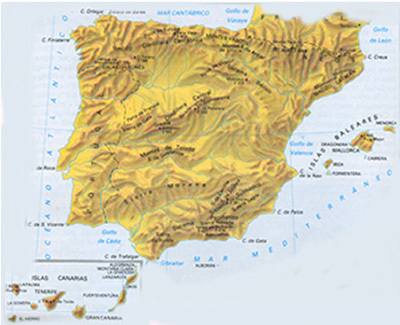 The Mediterranean climatic region extends from the Andalusian Plain along the southern and eastern coasts up to the Pyrenees, on the seaward side of the mountain ranges that parallel the coast. Total rainfall in this region is lower than in the rest of Spain, and it is concentrated in the late autumn-winter period. Generally, rainfall is slight, often insufficient, irregular, and unreliable. Temperatures in the Mediterranean region usually are higher in both summer and winter, and diurnal temperature changes are more limited than those of the continental region. Temperatures in January normally average 10 to 13 C in most of the Mediterranean region, and they are 9 C colder in the northeastern coastal area near Barcelona. In winter, temperatures inland in the Andalusian Plain are slightly lower than those on the coasts. Temperatures in July and August average 22 to 27 C on the coast and 29 to 31 C farther inland, with low humidity. The Mediterranean region is marked by Leveche winds--hot, dry, easterly or southeasterly air currents that originate over North Africa. These winds, which sometimes carry fine dust, are most common in spring. A cooler easterly wind, the Levante, funnels between the Sistema Penibetico and the Atlas Mountains of North Africa.